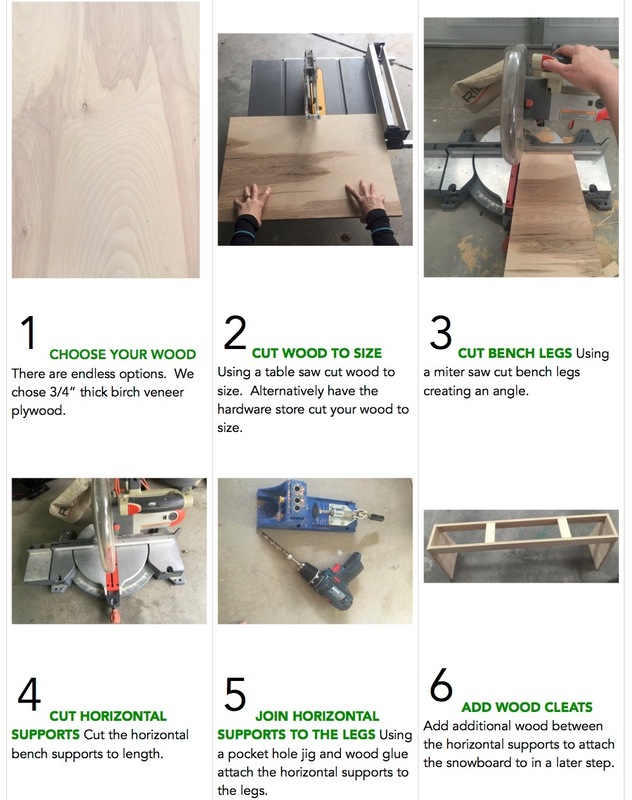 Step 1: First you will need to choose the wood you want to use for your bench base. For this project I chose to use 3/4″ thick birch veneered plywood that can be purchased from your local hardware store. The entire bench base was made from one sheet of 2′ x 4′ x 3/4″ plywood. 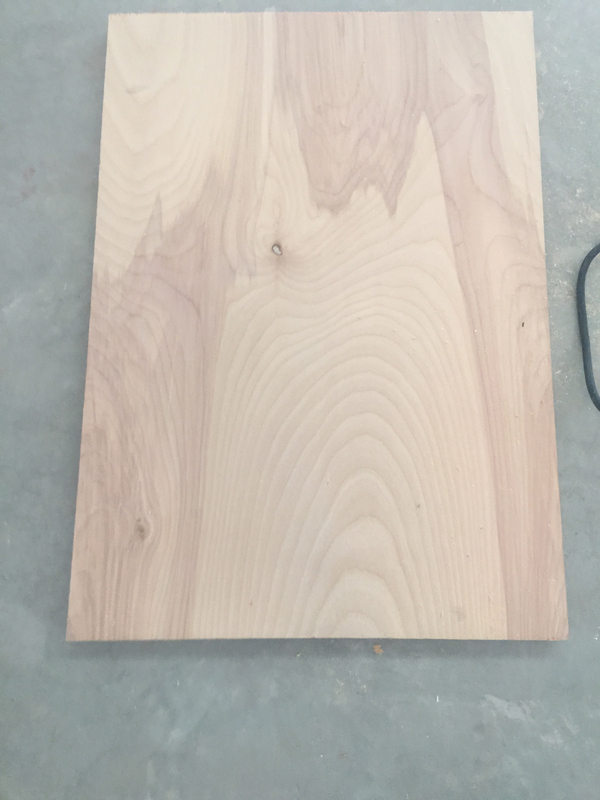 I chose the sheet of plywood I did because I thought the graining was very interesting. Step 2: Using a table saw I ripped the plywood down creating the horizontal supports and the legs. 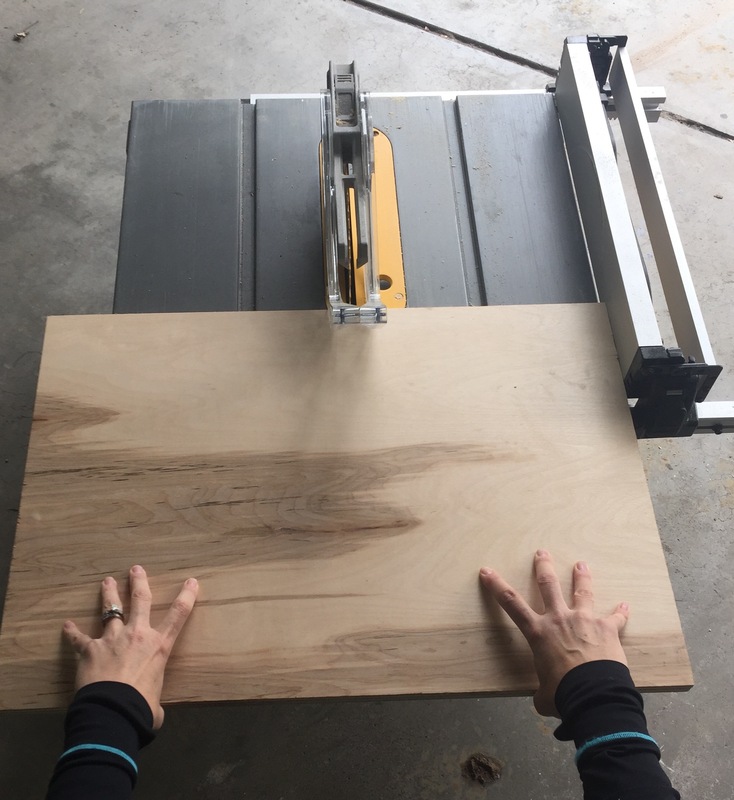 I first cut along the length of the plywood creating two pieces that measured 17 3/4″ wide x 4′ long and one that was 6 1/4″ wide x 4′ long. 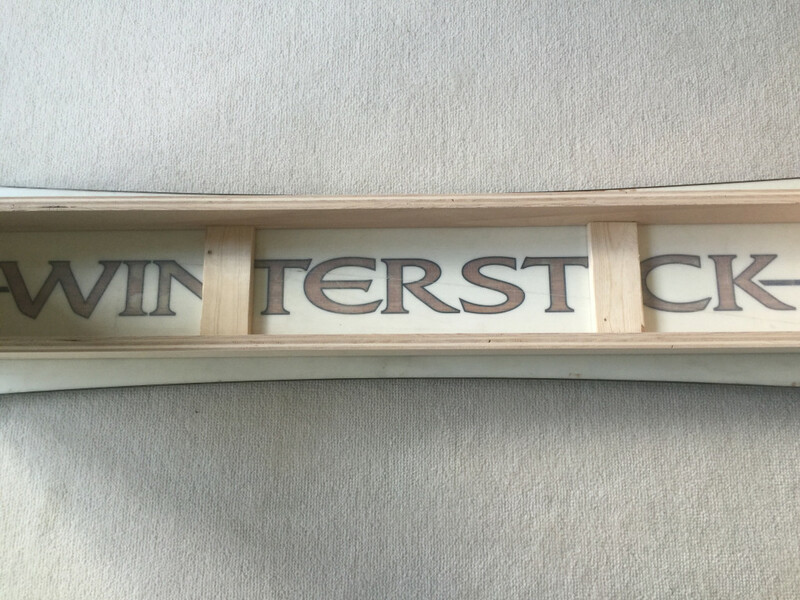 I then cut in half the 6 1/4″wide piece creating two pieces approximately 3 1/8″ wide x 4′ long. These will become the horizontal pieces for the bench. I then took the other piece that measured 17 3/4″ by 4′ and cut from that two pieces that were 11 1/2″ wide by 17 3/4″ long each. These would become the legs. 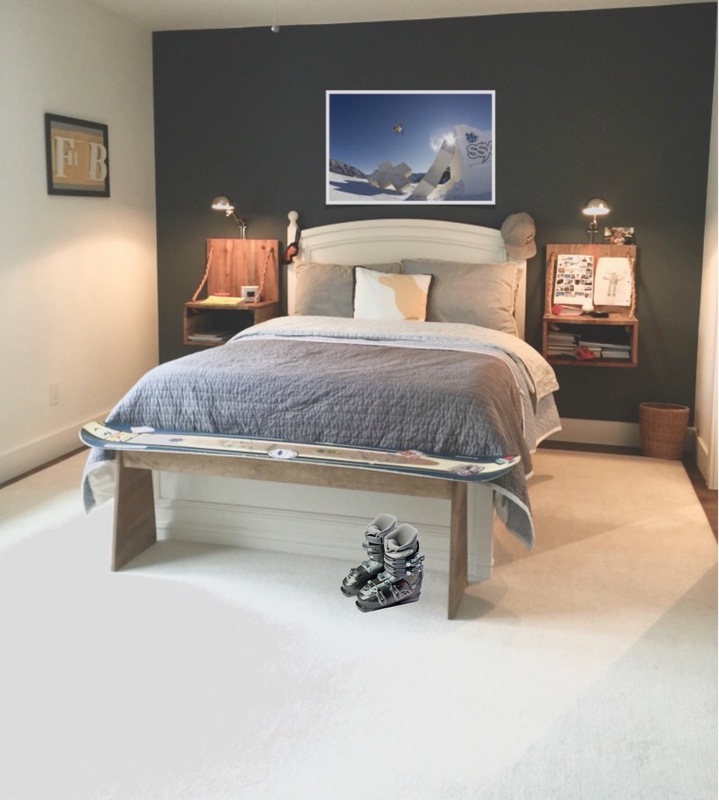 I determined the width of the legs by measuring the width of the snowboard where the legs would sit. 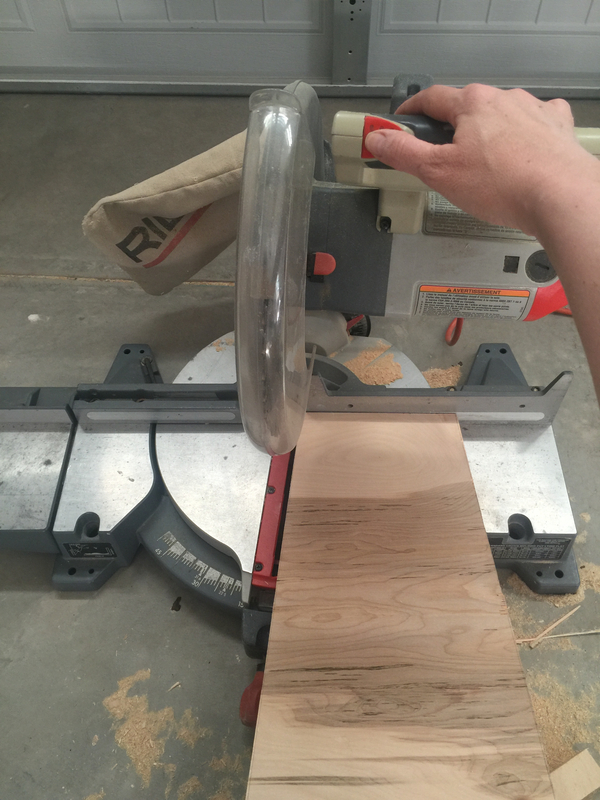 After making all the cuts I was left with a scrap piece of wood approximately 25″ by 17 3/4″. I will think of something fun to do with that later…..hmmmm…. 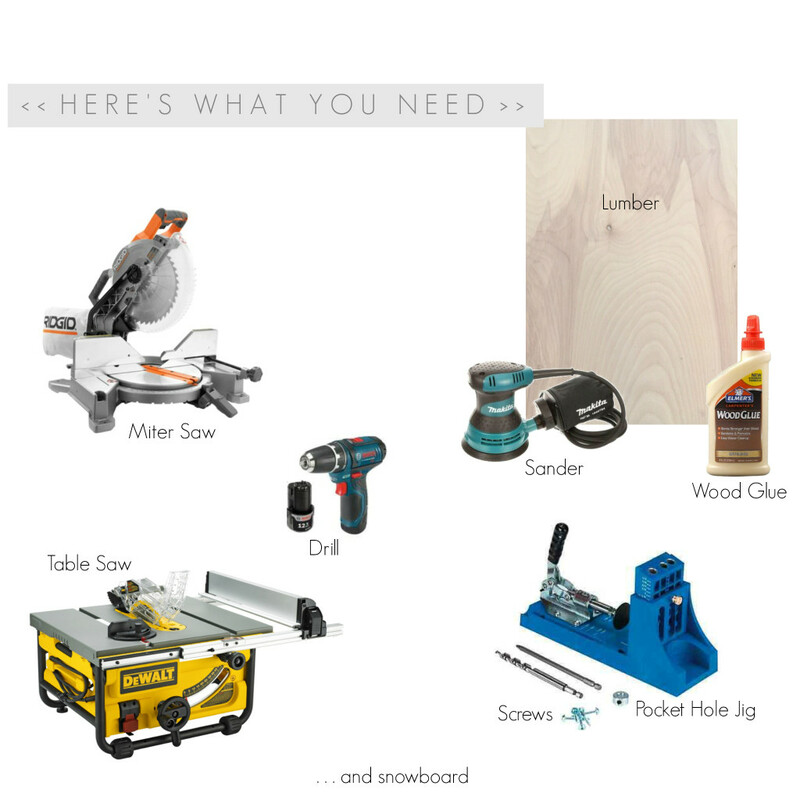 *Note if you don’t have a table saw no worries. Most big box hardware stores will do straight cuts for you. Bring your measurements and have them cut the pieces for you. Step 3: I decided I didn’t want the legs to be a rectangle with 90 degree sides. I wanted them to be angled. 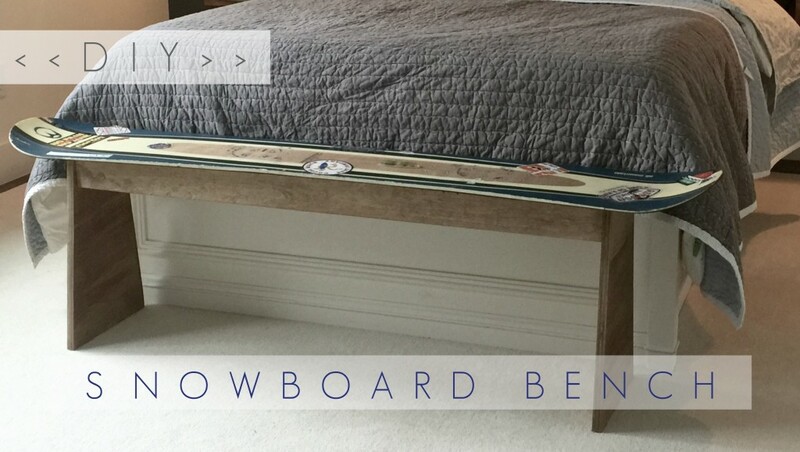 I wanted the bottom of the leg to be the widest part measuring 11 1/2″ wide and the narrowest part being at the top or under the snowboard at 7 1/2″ wide. 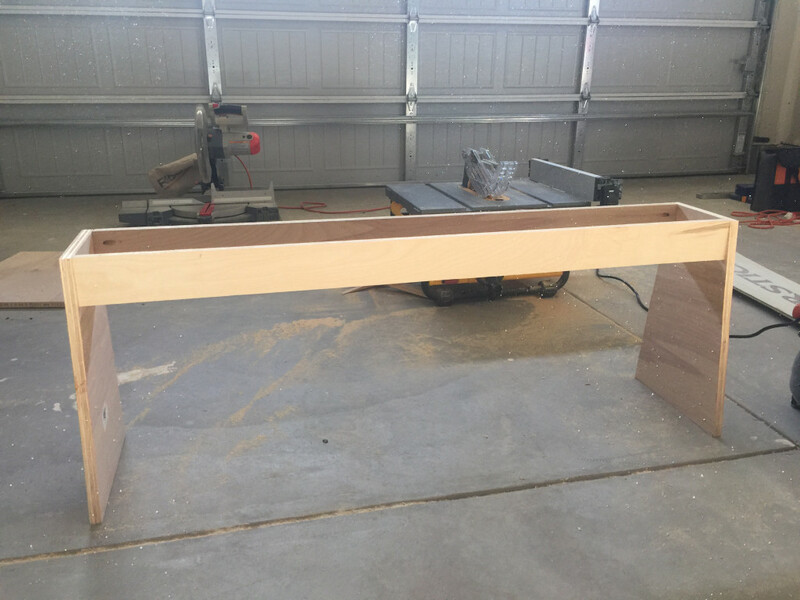 Using a miter saw I cut the angle into the sides of our rectangle. Step 4: Using the miter saw we cut the horizontal supports to the length that worked for our snowboard. I wanted the legs to be set in approximately 7″ from each end. 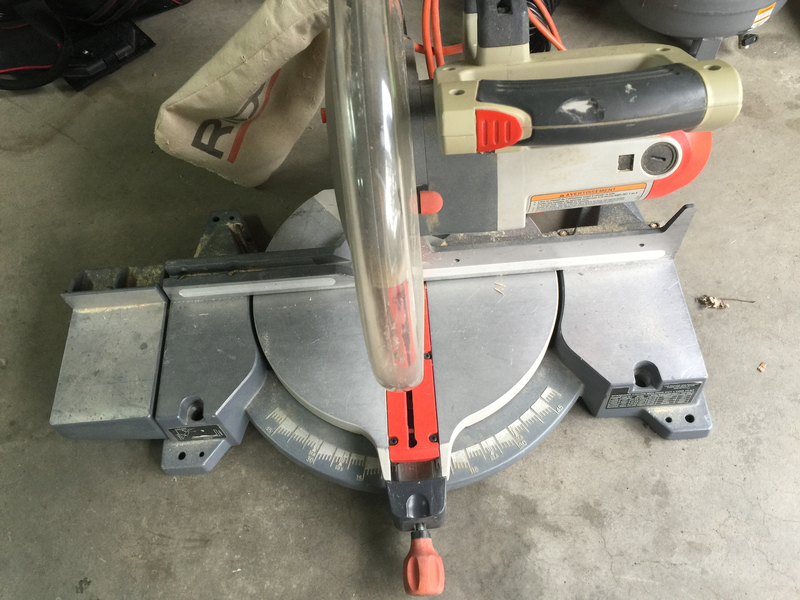 This meant I needed to cut the two horizontal pieces to 46 3/4″ long each. Step 5: Using a pocket hole jig I pre-drilled holes in the horizontal supports so that the holes would fall on the inside of the bench and thus not visible from the outside. 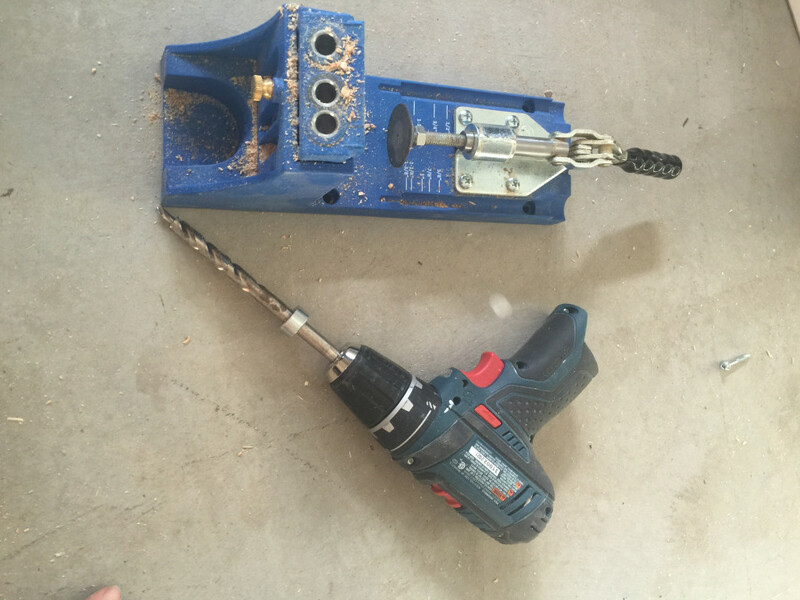 I drilled two holes on each end of each horizontal support piece. 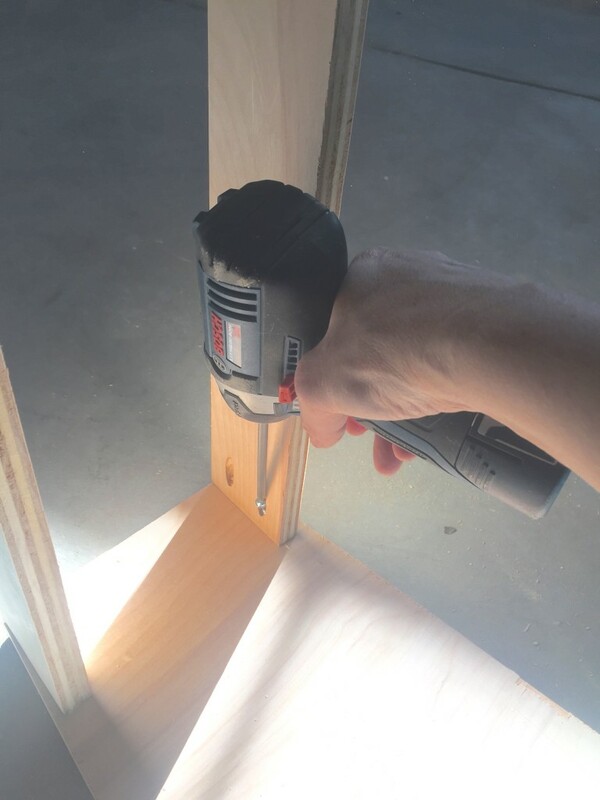 Using the pocket hole jig will allow me to drill a hole at an angle through the horizontal supports into the legs using self-tapping screws. The screws act as internal clamps holding these pieces together creating an extremely strong joint and neatly hiding every screw. Before screwing the pieces together I applied wood glue for added strength. Step 6: Between the horizontal supports I added two extra pieces of wood. 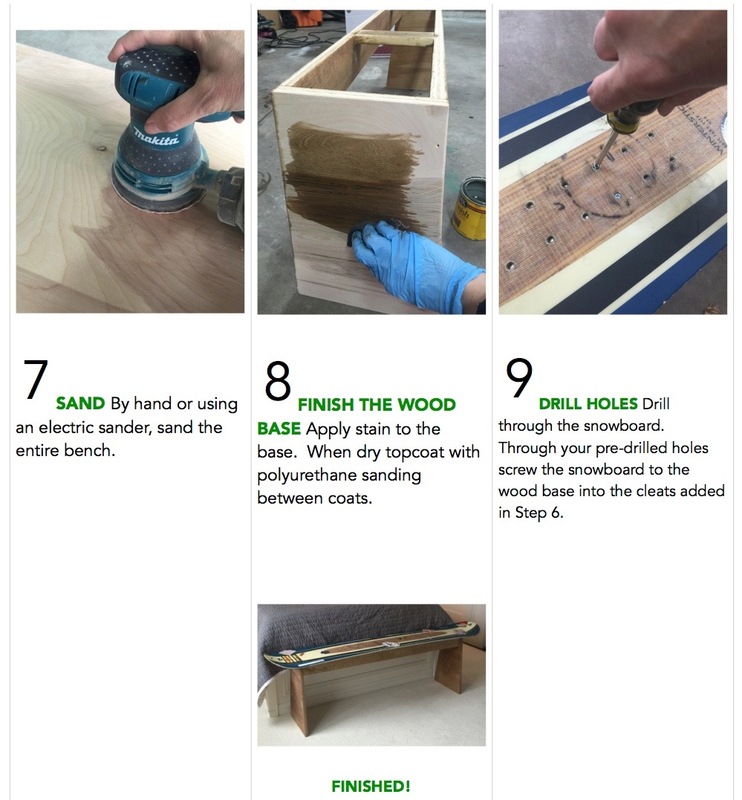 These were added so that I could screw the snowboard through the existing binding holes to our base in a later step (see Step 9). 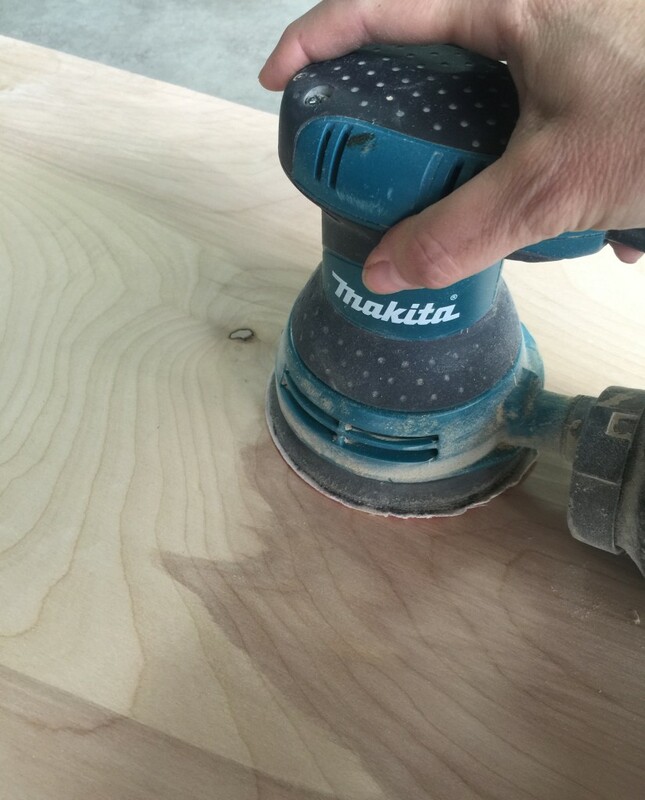 Step 7: After the bench base was assembled we sanded all surfaces of our wood using an orbital sander creating a smooth finish. 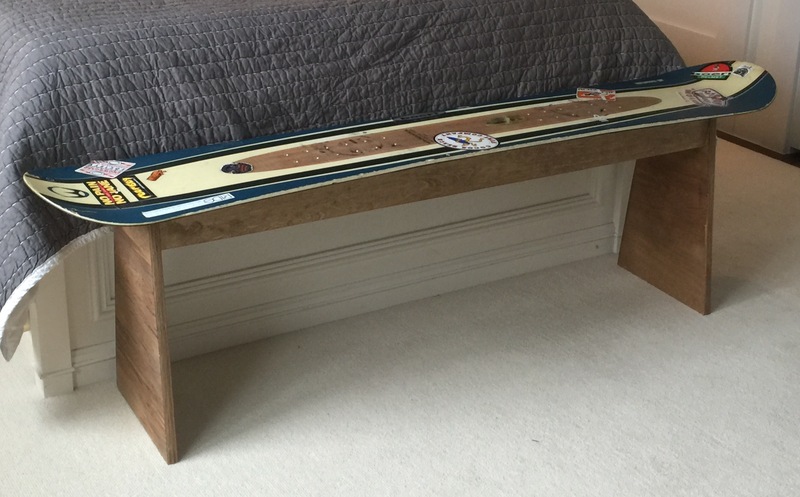 For this project I wanted the raw, but sanded smooth, plywood edges that I felt added an industrial look. Step 8: There are many ways to finish the bench: I could polyurethane it only; I could paint it; or I could stain it then polyurethane it. I chose to stain it then polyurethane it. For the stain I created a custom stain by mixing together Minwax’s Dark Walnut, Weathered Oak, and Classic Gray stains. I liked the depth of color after only applying one coat of stain although you could apply more if you want a deeper color. I applied the stain using an old rag while wearing protective gloves. After the stain was dry I applied 2 coats of plolyurethane in a satin finish. 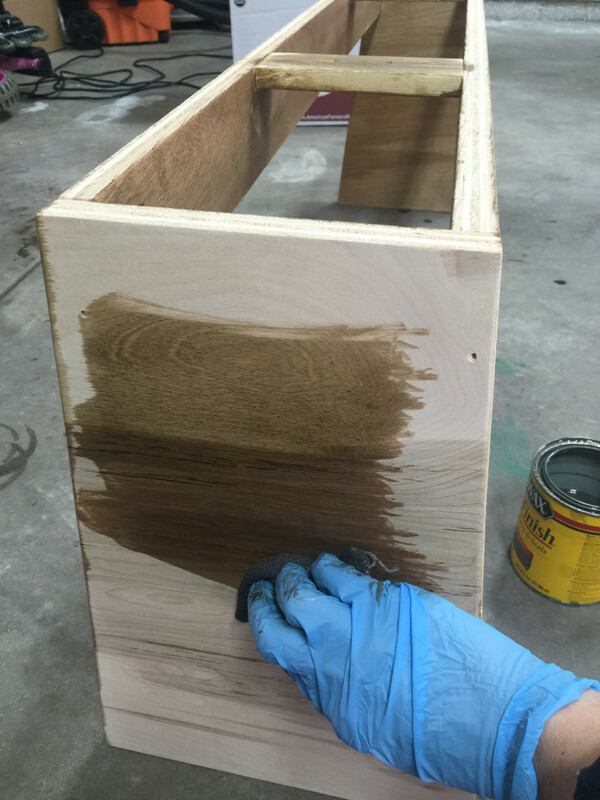 I lightly sanded between coats using 220 grit sandpaper creating a smooth finish. 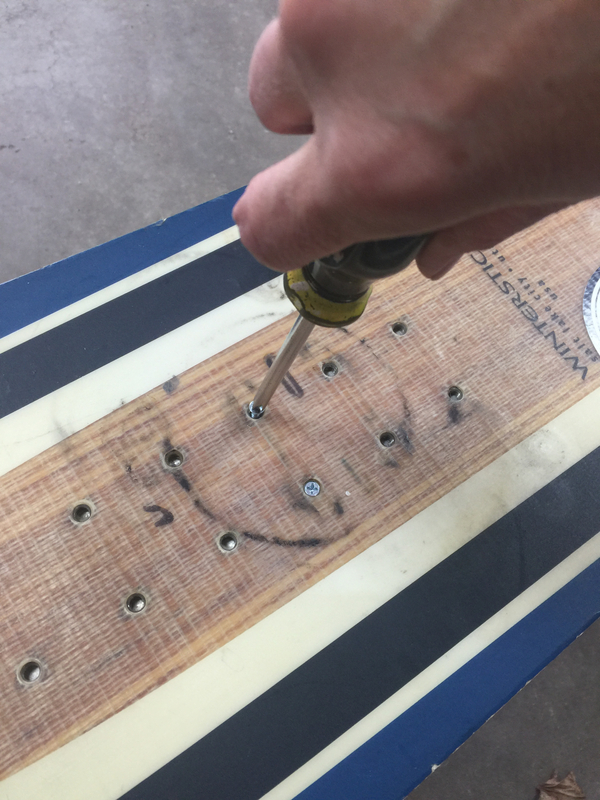 Step 9: Using a drill bit made to drill through metal I drilled through the snowboard binding holes that corresponded with the horizontal boards that were added in Step 6. 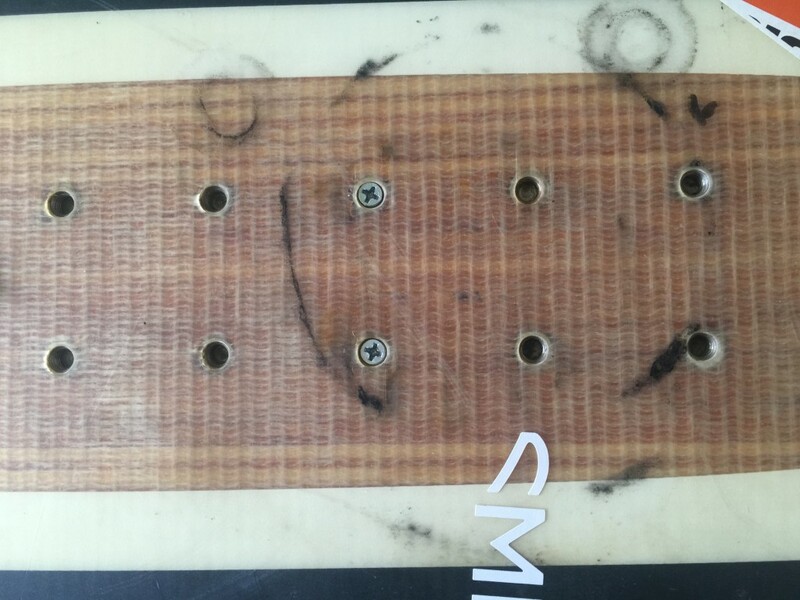 I chose a screw whose head was small enough to fit down in the snowboard binding hole without going all the way through allowing the screws to hold the board tightly to the bench. This also allows the board to be removed if needed.